5 WOMEN in German theatres from May 4th! The 6th and last edition of the Locarno International Film Festival under the artistic direction of Carlo Chatrian finished with success. 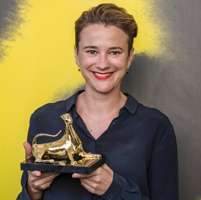 Germany's Eva Trobisch could happily return home with a little leopard, as her debut feature ALL GOOD had been awarded the Best First Feature Award.